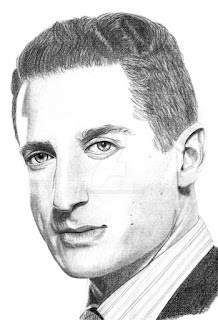 This is a sketch of Sasha Roiz as Sean Renard in the TV series Grimm. I still had to tweak the balance slightly in Photoshop since my scanner kills all contrast as a matter of course. However, I am working hard to build better lights and darks into my sketches from the beginning. Still getting over my fear over going in too dark and making a mistake! Overall, I am reasonably happy with this one; although, I need to keep trying to improve when it comes to hair. I can't yet get it looking as smooth as I'd like, especially when I see work by some artists who absolutely nail it. *sigh* Oh well, just keep practicing, I guess.